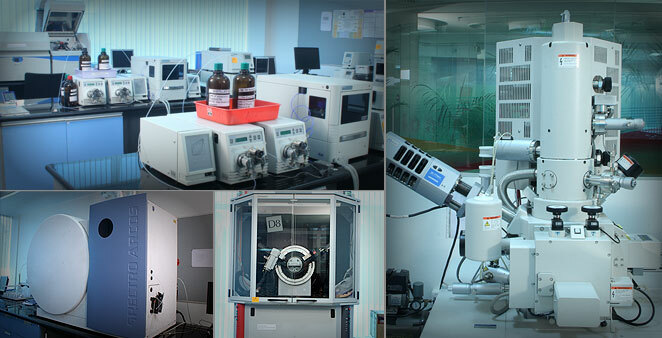 ABSTCPL hosts a world-class analytical testing laboratory at its Taloja campus. The lab spans an area of 20,000 sq ft with state-of-the-art equipment and quality management system tools. The lab is ISO 9001:2008 certified since 2010 and accredited under ISO/IES 17025:2005 by National Accreditation Board for Testing and Calibration Laboratories (NABL), Government of India, in chemical and mechanical testing. Our state-of-the-art laboratory has several resources to determine compositional and / or molecular structural information needed by our clients. Depending on the complexity of the problem, one or more of these techniques may be used to provide a complete analysis of a sample. Our scientists have extensive experience in analytical chemistry and routinely provide method development and validation for analytical testing. Whether you need to improve an existing method or develop a new method, we have a full range of capabilities in method development and validation as per the latest compendial guidelines. At analytical science and technology centre, you can be assured of efficient, robust and reliable methods to suit your specific needs. The analytical services team is well equipped to develop and validate custom analytical methodology that can be used for process control, product specifications and other applications. The team provides test data to characterise the solid state and polymorphic properties of various chemical and pharmaceutical substances and performs ASTM test procedures. The data obtained is used to qualify materials as per customer specifications, to help design materials for optimum end-use performance or to evaluate the effects of exposure environments on the stability properties of the materials in test. This application is helpful for pharmaceutical drug substances and drug manufacturing companies. Analytical science and technology has sophisticated metallurgical equipment capability and extensive experience in metallurgical analysis, including metallography, micro hardness testing, digital imaging, automated sample preparation and scanning electron microscopy. Tests for microstructure analysis, plating/coating thickness and quality, grain size, case depth, inclusion rating, porosity, corrosion tests and failure analysis are routinely performed. Our scanning electron microscope is utilised for fracture surface examination and high-resolution micro structure examination. Energy dispersive x-ray spectroscopy is used for elemental analysis of constituents and compounds. Analytical services provides analytical testing using classical wet chemical methodology and advanced analytical instrumental techniques that conform to ASTM and regulated authority procedures. These procedures are applied to analyses of coating resins, plastics, adhesives, foundry binders, chemicals, pharmaceuticals, organic and inorganic impurities, heavy metal characterisations, organic elemental analysis, etc. The Analytical Science and Technology group includes experts on Six Sigma activities and provide problem-solving solutions to quality issues. The Analytical Science and Technology group provides services in setting up quality initiatives and analytical laboratories with better productivity and efficiencies. The team also coordinates with the Analytical Project Proposal System to define protocols for solving the more complex, non-routine requests. The process involves strategy meetings, itemised experiments, tests, or analyses, and follow-up meetings in collaboration with the customer. The team also coordinates with the Analytical Project Proposal System to define protocols for solving the more complex, non-routine requests. The process involves strategy meetings; itemised experiments, tests, or analyses; and follow-up meetings in collaboration with the customer.